I was invited a few weeks ago to join a group of men up in Northumberland. This was to mark and celebrate the transition of a man into Fatherhood – James, a very dear friend who I hadn’t seen in a couple of years. He happens to be half my age, so at a very different phase of life. I had little idea what I was heading up to, other than we had use of a cottage on the coast at a place called Low Newton, and there would be about a dozen of us. 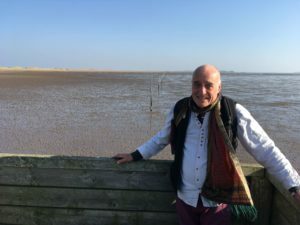 The long journey up country was a pilgrimage in itself and I arrived at the welcoming Ship Inn around mid afternoon imagining everyone else would already be there. Not so. It seemed I was the first of the group. Most others already in the pub were visitors for the day – it being gloriously sunny – the hottest Winter day on record – surpassed only by the day that followed. I got chatting to a local couple – although he was originally from Belfast and she from Scotland. They had been in the village for forty five years. He had come originally to man the navigational station on the headland; one of series along the coast. Now these have all been replaced with satellite navigation systems. Yet this couple stayed on after he was made redundant because they had come to love the place. In those early days they recalled, the whole area outside the pub had been covered in numerous fishing boats with all the attendant activity which goes with fishing and a vibrant community. Now there is only one boat active – skippered by the husband of the pub landlady as it happened. I was struck by how much has simply ‘fallen away’ within a generation: the navigational posts, the boats, the fish, the people. Part of ‘the great thinning’ as I have heard it called recently. Then I spotted a group of three young men who were likely candidates as being friends of James too, with their Bohemian appearances and musical instruments. So it proved to be – Aedan, Joss and Sam were indeed part of the group I had come to join. Before long we had located the cottage – a minute’s walk from the pub; the last habitation at that end of the village. Behind the cottage was a flooded field with simply hundreds and hundreds of birds either on it, in it, around it or above it. Swirling flocks of widgeon, grey lag geese, redshank, oystercatcher, wagtails and many more, fluttered and squawked, gracefully gliding the margins. It was a winter haven and bird heaven. An equally wonderful place of retreat for us too. One by one the men rolled up; Josh, Jody, Tom, Adam and Bill, joining James, Sam, Joss, Aedan and myself. Being men of music, it wasn’t long before the first of a wonderful succession of jam sessions was underway – appropriately enough – in the kitchen. Several of those present were truly accomplished musicians – as good as anything I’ve heard. Truly inspiring. We were all part of it. Immediately lifting the spirits. Two or three of us cooked together as the music wafted over us and magically pervaded the food. Later a few of us went along to the beach. Incredible and awe inspiring firmament above. I couldn’t stop looking. With no light pollution and the sound of the waves washing in, the constellations came fully alive, with the mythical stories of old reflected in the stars chase across the gloriously visible Milky Way. We lit a fire in the shelter of the dunes on the beach and sat sharing music and story until the wee hours. Sleep was a luxury for those able to enjoy it – several in tents on the grass at the back of the cottage, with the constant questionable lullaby of squabbling birds on the lake nearby. Others of us in the house. Me blessed with my own room – a bestowed benefit of being considerably older than anyone else present. Dawn broke as full and vibrant as any Spring day – yet it was still the tail end of February – beautiful and alarming at the same time. James had expressed a wish to do something a bit different and a bit special to mark this time together. And so it proved to be. Getting everyone together to head off in convoy up the coast, proved to be amusingly frustrating. As one man finished his shower, another was cleaning out his car, as yet another was heading off to clean his teeth, whilst someone else decided on a spontaneous phone call to check out an old friend. Each oblivious to the other or to their action’s impact on the group as a whole. The term ‘herding cats’ was never more appropriate or deserved. Eventually however, we headed off. I think it was Jody who had said the night before, that in planning group activities, the rule of thumb is to add five minutes for each person. It proved remarkably accurate – we were an hour late in leaving. 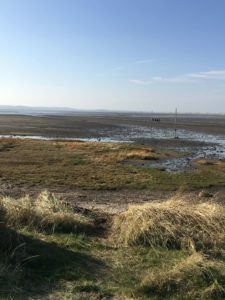 We had decided to head north a short way up the coast, where we parked up on the landward side of the causeway heading over to the ancient Isle of Lindisfarne – The Holy Isle. Our aim was to walk the old pilgrim route across to the island – only possible when the tide is out. But first we gathered on a grassy knoll in order to centre our intention and express what was in our hearts. As the natural, indeed only, older man present, I took the lead in facilitating this, first centering us all and then enabling an expression of how we best honour the occasion, expressing brotherhood through our blessings and commitment to the soon to be father, James. It was extemely moving and powerful, each of us adding our gifts into the symbolic cloak of protection we were weaving for James and his partner Mairead and emergent child. We sealed it with a song. There was magic in the air. In this way we lightly yet powerfully carried our communal spirit across the waymarked route towards the sacred isle in the far distance. It looked to be a fair old way away. I gather it is of the order of three miles in distance. Yet it is anything but a straightforward walk as we were soon to find out. Just to compound the challenge, a couple of us decided to go barefoot, a decision I seriously questioned after a couple of minutes as the purposely rough tarmac of the causeway bit into the soles of my feet. 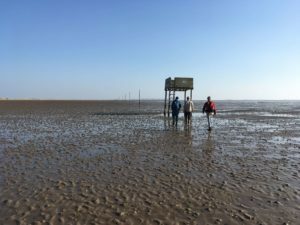 Fortunately, after a couple of hundred yards we veered right and out across the extensive expanse of the tidal plain, with guiding poles around twenty feet high stretching out in a seemingly unending line before us. It was the most gloriously and vibrant sunshiny day, worthy of memory even without allowing for the remarkable and special time we were in the midst of sharing together. The pilgrims route was slightly daunting as it was inspiring. Mud oozed between the toes for a stretch. Then followed a period of negotiating rippled sand which was dazzling and almost hallucinogenic in its mezmerising ability to hypnotise. This was only one of the tricks that the pilgrim route had in store for us. for those unlucky enough to get caught out by the tide. It made one wonder how many people had availed themselves of this unique and basic form of hospitality. And how many before their existence had perished for want of such thoughtfulness. It was easy to imagine the tide rushing in and a dirth of options for survival. A weathered and rusty plaque on the side of one such structure informed us that it was Nat West Bank to whom we were indebted on this occasion. Then came a period of negotiating small creeks and stinking sticky mud which on occasion glooped up, nearly to my knees, sucking me disturbingly down further into adhesive gunge . There followed a spell of negotiating sands riddled with thousands of small sharp shells. All the while the half mirage of the dunes in the distance, with the occasional ant like vehicle catching the sunlight. Gradually and imperceptibly, we gained ground and the island became nearer than the mainland. Meanwhile we chatted and shared stories, inspired by location, vacation and vocation. It felt unusually rich. Later once we’d had a chance to reflect, we all acknowledged the ‘specialness’ of it all, that unusual coming together of time and space, people and place in magical constellation. How blessed were we this day. Eventually we reached the island – a real sense of gratitude to reach terra firma. A couple of hours wandering the ruins of the Priory, then sharing a cuppa and cakes as the sun began to wane, before heading back again. The long trek back, with a somewhat chilly headwind as we headed roughly west, the sun slightly to our left. Each guide post a reminder of the invisible guide posts of life and how readily they can be lost – especially in a fog or mist. Then, it is easily possible to symbolically drown in life too, as I have done on occasion, simply through lack of awareness. So I was deeply grateful to the posts now and fully aware of their value and significance. I saw one or two of our group wander off track a few times, then have to back track or correct their course as they realised that the posts were in that alignment for good reason. The sea, as with life, deserves great respect and honouring lest it take us unawares. It was fitting that we made it back to the mainland literally just as the sun gently lowered itself from view over the horizon. I felt replete; nurtured and nourished at so many levels. That evening we again made fire on the beach – just us in group solitude, now with Ian and Merlyn joining us, while Adam and Bill had had to depart. The magic of the stars, the sea, the sand, the spaciousness. Around the fire we shared song and soulfulness in gratitude and graciousness, before heading to bed. Simplicity and depth. Music and mirth. Reverence and harmony. I slept well – just not for very long. Dawn was already approaching.